The Governor of Arunachal Pradesh Brig. (Dr.) B.D. Mishra (Retd. 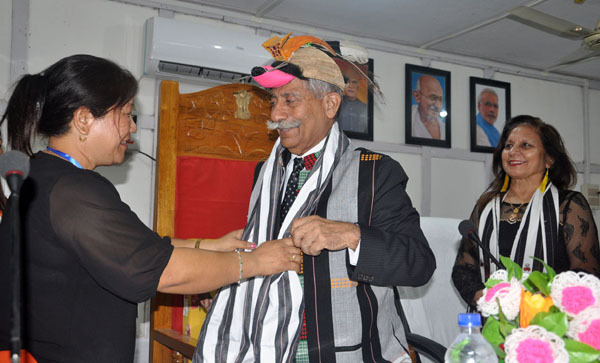 ), accompanied by the First Lady of the State, Neelam Misra in this two-day visit to Kurung Kumey District arrived at Koloriangon Wednesday. With this district visit, the Governor has visited all 22 districts of the State. Addressing a public meeting at Koloriang, the Governor said that earlier it was ‘Look East’ but today it is ‘Act East’ and it has resulted in large number of projects coming to north east region. It is important that people of the State benefit from these projects and it can be possible only if every paisa is properly utilized. He further said that to realize it, every citizen must shoulder responsibility to ensure that the projects are implemented with transparency, accountability, continuity, audit and review and if required midterm correction. Such public participation will increase the pace of development in the district and State. Stating that road and IT communication are vital for development of Aruanchal Pradesh, the Governor pleaded to the people to cooperate in the construction of road and laying of cable. He advised them to review the land compensation component and be reasonable wherever land compensation is required. It should be reviewed as a social community responsibility and people must be conscious that it is not for the benefit of department, agency or the Government but it is for the benefit of the people. The Governor advised the people to strengthen the health and education sectors by actively involved in Swachh Bharat Mission and sending every child above the age of six. He reiterated on rational posting of medical officers and teachers covering rural and urban areas. The Governor called upon the farmers to experiment new crops and cash crops to double their income. He said that the great asset of farmers of the State is organic and they must continue the practices. Local MLA Pani Taram and Kurung Kumey Deputy Commissioner Kanki Darang briefed the Governor about the district and its challenges. Taram also submitted a four-point agenda including porter tracks to international borer, Advance Landing Ground at Koloriang and model village for Puroik community. Earlier on the arrival at Koloriang, the Governor and the First Lady of the State were accorded traditional reception by the public leaders, Gaon Burahs, PRI members and public of Koloriang. Reroute to Koloriang from Palin, the Governor’s entourage took a brief halt at Sangram. Interacting with Gaon Burahs and PRI members, the Governor appealed them to actively participate in the developmental process. Stressing on education, he said that every child above the age of six years must be send to school. He also shared information regarding army recruitment rallies.